During the five days of the World Economic Forum Annual Meeting, the talented Barry Colson has for years owned the anchor entertainer top spot at Davos’ Hotel Europa where the most highly credentialed multinational CEOs sing, badly but passionately, along with the uncredentialed hoi polloi who want to collect stardust wherever they can go without being blocked by battalions of Swiss WEF security mercenaries. ‘The Mooch’ loves the place. So too Paul Jacobs, the once and perhaps future CEO of Qualcomm. Last year, Bloomberg Global Media Chief Justin Smith and Mylan CEO Heather Bresch all sang along (with yours truly) in a temporarily memorable version of Neil Diamond’s Red Red Wine — following Point72’s friend-of-Steven Cohen-only crowd of those who love and appreciate 100 point wines. (Cohen himself was unable to make it to his own high-sizzle deal). After wine-tasting (or wine-guzzling the ‘100s,’ Barry got going, pounding his keys and belting out sing along songs, but yelling to the happy but unsteady to keep drinks off the piano, which was mostly a platform for his electric keyboard — finally shorting out when the fermented barley of too many revelers became a circuit board flooding beer-nami. This is one of the scenes anyone near Davos who treks up the mountain by car, train, or helicopter can have every evening. There is always someone interesting around Barry’s piano, and their guard is down. Corporate, NGO, and Foundation titans; Treasury Secretaries and national security advisors; modern versions of Fagin and the Dodger many times over, but no Olivers; share secrets, gossip about business conquests, talk dirt about Trump, and beyond that, generally, just lose themselves in a scramble of big ideas, more lasciviousness than one might expect in this era, and crafted cocktails. Groundhog Day can strike every day during WEF week with Barry at the Europa, but then there is dinner with Paypal’s Dan Schulman on financial inclusivity for the unbanked or the CNBC/Quartz party on the mountaintop on Monday, or the Global Blockchain Policy Council crowd, or the Oleg Deripaska blow-out which managed last year an oligarch humble brag of Enrique Iglesias performing amidst unlimited aged magnums of Dom Perignon and uber grande sized tins of the blackest caviar. Georgetown and Princeton have polite parties. PwC hosts one of my favorite hang-out lounges and offers hats, mittens and shoe cleats for the outside bound. Every night, there are dozens of stacked to-do options — some gatherings designed to kill brain cells and some that actually elevate and educate them. I don’t agree with my critical friends as I find Davos a place where I still encounter architects of attempted global improvement, real heroes, in my book, focusing on rampant in-nation and among-nations wealth gaps, global environmental degradation, the refugee disaster, gender and LGBT rights battles, the strangulation of civil society and free expression, cancer and alzheimers research, or any number of other vital global public goods deficits that smart strategists and activists try to seduce global elites to acknowledge and commit to fixing. I was at the dinner last year when George Soros gave his Sheryl Sandberg-radicalizing speech about how Facebook and Google, among others, were becoming dangerously powerful platform monopolies that needed to be regulated to protect the public interest. Somehow or another it was that speech that got Facebook to hire outside firms that thought it fine to launch insidious, anti-Semitic slime ball attacks against Soros. I’ve been told Soros will give an equally provocative set of remarks this year at the Hotel Seehof, and I’ll be there to share what I’m sure will be take-no-prisoners remarks. Can’t wait for that one. I also had conversations last year with the IMF’s Christine Lagarde with the aforementioned Dan Schulman, iconoclastically for Davos clad in jeans and a long sleeve t-, on what rich countries and banks still needed to do to fill in the gaps of finance for nations and peoples who were neglected in credit and banking networks. Salesforce CEO (and TIME’s new owner) Marc Benioff told me that if managed right, crypto currencies and blockchain could revolutionize how every person’s talents and efforts are rewarded and paid for. No more middle men, agents, perhaps even ‘media operations’ with ‘stables’ of writers. I also wrote a piece for The Atlantic on Trump not delivering his flamboyantly disagreeable, pugnacious, anti-globalist self and leaving the place disappointed. People wanted “to be in the room when Trump happened” — but he was a nearly genteel, seemingly sedated version of himself, at least in the big public event. 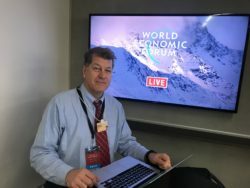 I understand the cynicism about WEF, but consequential conversations happen in Davos, and I’m going because I want to hear them, and be a part of the debate about how what WEF founder Klaus Schwab calls the Fourth Industrial Revolution is going to work and still keep humans in the picture. Remember Bill Joy’s dystopian Wired essay an eon ago titled “Why the Future Doesn’t Need Us“? Well, I do — and I worry about real people, the ones driving our trucks, and building our roads, and caring for the elderly, and doing all sorts of work that few attending the Davos gathering know much about. Also, I’m going because Donald Trump and no one from his Cabinet is going. That’s a bit of a fib as I would have gone if they were there in attendance this year. But the world feels America slipping away from it, at least from alliances the U.S. was tethered to, and even from rivalries that had been defining for some countries that have long preoccupied America’s strategic class. It’s easier to take stock of how global elites feel about America’s power contraction when no one has to pretend to be polite because the American President is in town. This is why I’m going, and I look forward to sending dispatches on the tidbits I pick up and perhaps some interviews I do. I’ll post everything here at TWN. If you want emails sent to you of my postings, zap me a note at scclemons (at) gmail (dot) com — and I’ll add you to the list! Trump Dropped Davos — So Empty Without Me?